Ahh, sour beers. How do I love you? This is an Oud Bruin, an old brown ale. It is called old because it is aged for up to a year. During the aging process, the characteristic sour flavor develops from secondary fermentation. This style is less sour than the Flanders Red, another sour Belgian. This beer had a beautiful ruby color. It was lovely to see the light shining through it. The head was thin. I had expected more, but I don't know how long this bottle sat on a shelf before I found it. The beer was sour, but less so than several I have had. It is a little sweet too, a taste of cherries. I liked it, but I've had better. 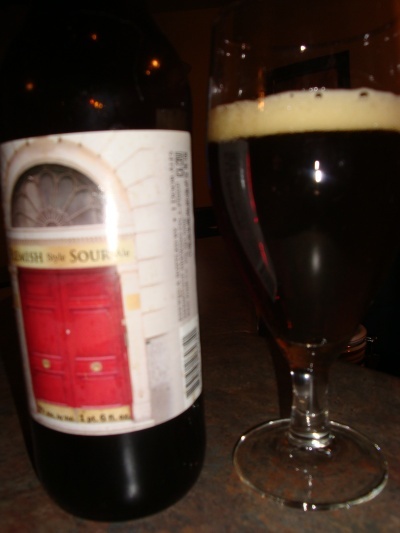 I think I prefer the Flanders Red style of sour beer a bit more. This is the first example of this style I have tried, so I should try a few more before I settle on that opinion, but I like a bit more sour in my sour beer. This beer was understated, muted. A good beer, but not amazing.